India’s energy diplomacy will take a significant jump when it will host two back-to-back summits – one on solar energy and the other on hydrocarbon – on March 11 and April 10-12 in New Delhi. The first, to be held under the banner of the International Solar Alliance (ISA), will be attended by leaders and representatives from 121 countries, while the second will have over 60 energy ministers, 30 CEOs of oil and gas companies, 15 heads of international outfits like Organisation of Petroleum Exporting Countries (OPEC), International Energy Agency (IEA) and International Gas Union (IGU). “We have initiated the process for the single-day event of the ISA on March 11,” says K Nagaraj Naidu, joint secretary in the external affairs ministry’s western Europe division. According to him, 26 heads of government and state, 10 deputy prime ministers and minister-level officials, UN Framework Convention on Climate Change (UNFCCC) executive secretary Patricia Espinosa, heads of the six multilateral development banks, and members of civil society and research institutions will attend the meet. To be inaugurated jointly by prime minister Narendra Modi and French president Emmanuel Macron, it promises to be a major event in the renewable energy sector. As a key stakeholder of the meet, India, Naidu says, will extend lines of credit worth millions of dollars to specific solar energy projects in ISA member countries. The ISA summit was earlier expected to be held on December 9 during Macron’s proposed maiden visit to India. It was postponed as France wanted a ratification of the ISA framework agreement by more than 15 of the total 121 countries which are members of the solar alliance initiative. On the sidelines of the UN Climate Change Conference, ISA, an India-led initiative to reduce carbon footprint in the countries falling between Tropics of Cancer and Capricorn, was launched by Modi and then French president Francois Hollande in November 2015. 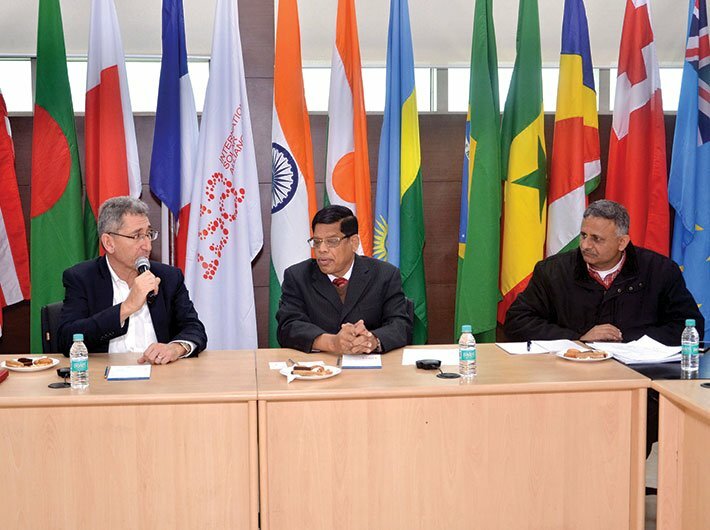 India and France together with the rest of the members of the solar alliance had agreed to resolve in a coordinated manner problems of finance, technologies, capacity building and others coming in their way. They had also agreed to ratify a framework agreement of the ISA without much delay. Yet, only over two dozen countries have so far got the ISA framework agreement ratified through their parliament or cabinet, although the number of countries that have signed up the framework agreement has gone up to 55 now. The ministry of external affairs, which together with the ministry of new and renewal energy (MNRE), is playing a crucial role for the success of the ISA summit, is spearheading the process of getting more countries to sign up and ratify the framework agreement. It is expected that by the end of this year, the rest of members will complete the process of ratification. According to Upendra Tripathy, interim director general of the ISA, “There is immediate attention for the development of 121 projects of solar technologies in 121 ISA member countries by April this year.” Similarly, the MNRE says ISA’s major objectives include deployment of over 1,000 GW of solar generation capacity and mobilisation of investment of over $1,000 billion into solar energy by 2030 across the world. The ISA is also working on a plan to create a $300 billion risk mitigation fund as part of the strategy to create a sustainable financing architecture for solar power projects across the world. The fund will be used to insure solar power projects against risks such as default due to foreign exchange fluctuation and regime change. For India, however, the challenge is to achieve 175 GW of installed renewable capacity before 2020. Tripathy is confident to meet the target within the time-frame. In this regard, he hints at the central government’s announcement to set up a $350 million fund to be utilised for the purchase of solar energy technology. Still it seems incongruous that while it is championing the cause of fighting CO2 emissions in the country and talks in loud voice about replacing conventional energy with renewable energy source, it is leaving no stone unturned to increase its share in hydrocarbon energy. If Sunjay Sudhir, joint secretary in the ministry of petroleum and natural gas, is to be believed, the IEF platform will be used to showcase investment scope in the country’s oil and gas field. India wants to attract $40 billion worth of investment in the oil and gas sector in the next five years. The ministry of petroleum and natural gas has already put on auction 55 blocks for exploration in oil and gas, for the first time in eight years, on January 18. These blocks were offered under Open Acreage Licensing Policy (OALP), a liberalised regime under which an oil company can select a block of its choice which was not possible earlier. The aim behind bringing OALP is to increase India’s indigenous oil and gas production by maximizing the potential of already discovered hydrocarbon resources, says the official. The last date of bidding of these blocks, spread over a 59,000 sq area, is April 3. As per the petroleum ministry official, these blocks will be awarded to a company which offers the highest share of oil and gas to the government. The awarding activity will take place either in June or July. Majority of these blocks are on land and in the states like Assam, Gujarat and Rajasthan. India is estimated to be holding 315 billion barrels of oil and gas resources. Of this, only 95 billion barrels have been recovered so far. Such a scenario will be presented before the IEF gathering in April. So far, as per sources, no foreign company has participated in the bidding, yet they are hopeful that some overseas companies will join the process by March or as the bidding process draws closer. Around 700 delegates are expected to attend the 16th IEF ministerial meet. China will organise the next meet of the forum in 2019. Sources refused to attach significance to the coming together of India and China for the IEF meet. “We are looking at things from the business perspective. We don’t want India-China geopolitical rivalry to overarch their economic engagement, but unfortunately it is not happening,” one of the sources said. The petroleum ministry official also echoes the sentiment. “Politics and business don’t go hand in hand while dealing with a commercial project,” Sudhir, a 1993 batch Indian foreign service (IFS) officer, remarks, indicating that energy diplomacy does not recognise eyeball-to-eyeball positioning which is usually seen on the Line of Control and the Indian Ocean region between the two Asian rivals. Interestingly, the IEF meet will also be attended by Iran, which agreed to sign a deal with India on Farzad B gas block during the recent visit of Iranian president Hassan Rouhani, after snubbing it earlier. Therefore, when IEF takes place, it will not be surprising to see that many geopolitical rivals and enemies sit together and have discussion on issues like improving productivity, investment and innovation in the hydrocarbon sector in their respective countries.